Capriccio of a statue on a plinth beside a ruined archway. Above the arch is an inscribed panel. Below the statue eight steps lead to a courtyard, seen through the arch, with a three-bay arcade. 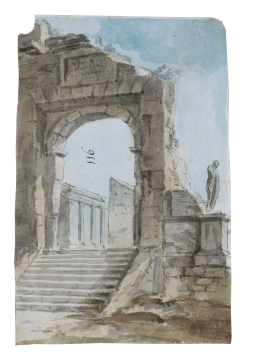 You are here: CollectionsOnline / Capriccio of a statue on a plinth beside a ruined archway. Above the arch is an inscribed panel. Below the statue eight steps lead to a courtyard, seen through the arch, with a three-bay arcade. Undated, probably 1755 or 1756. The archway depicted is a variation either on the Arch of Dolabella and Silanus, or the more popular Arch of Titus, of which Charles-Louis Clérisseau made numerous drawings, but the rest of the composition is invention in the latter's style. A similar figure on a plinth appears in the views by Robert Adam and Clérisseau of the riverside at the Forum Boarium (see Clerk Collection, Scotland, Clerk 75 and Clerk 76).